Hello BIA-OC 55+ and NextGen Council Members! Hello! 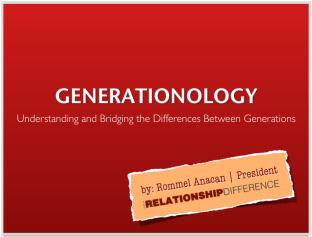 If you attended by recent Generationology program with BIA-OC and the 55+ and NextGen Councils, thank you for being such amazing people to work with! I enjoyed chatting with many of you...and hearing your stories (both good and bad...lots of bad) about working with the different generations! If you'd like a copy of the slides, simply click on the picture to the left and you'll be able to download a PDF file of the presentation.